No, not volumes containing tales of mystery, but those which present a mystery (or a headache, depending on the time of day) for yours truly when cataloguing in historic houses. 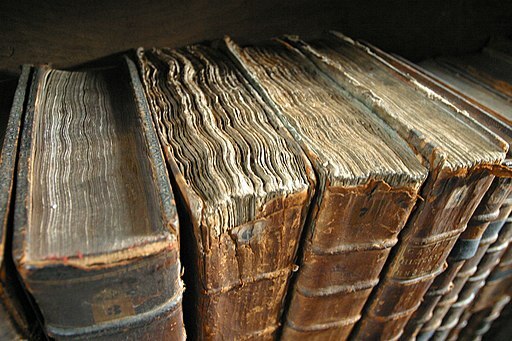 These books are usually incomplete and rather worn out over time. It’s not so bad if the title page is still present, but it becomes trickier in the absence of one. Even more so when, once the book is roughly identified, it turns out there is more than one edition listed on the union catalogue! The other problem might be that I don’t always have access to the large online databases for eighteenth-century and earlier English language books. Like a detective, the intrepid bookcataloguer needs to search for clues to help identify the item in hand. Sometimes it is a relatively straightforward process of deduction; at other times, it is simply impossible to figure out what the book is. For example, here is one that I found recently at Erddig. The book lacks a title page and doesn’t for the most part have page numbering. It clearly is a Greek-Latin dictionary and my instinct was that it is eighteenth century. The absence of page numbers for the majority of the book (there was a section at the end which did have numbering) meant that I had to look at the signatures at the bottom of the leaves. The first one I found was D1 – clearly, the book didn’t just miss its title page, but also most of the first three gatherings. In the handpress period (i.e. before ca. 1820), pages were set on large sheets of paper which were folded after printing. Depending on the number of folds, the leaves would be marked up with a signature (A1, A2, A3, etc.) at the bottom of the right side of the leaf (recto). After folding, the leaves would then be gathered and bound (hence, gatherings). The next thing I looked for was any additional information in the book itself. This is where any marginal or intertextual scribbles become very useful indeed! In this case, it was clearly heavily used, probably in a school context. There were plenty of doodles and annotations to suggest that the dictionary had been used by a young person of school age. On leaf 3F3 I found the inscription ‘Brownlow Yorke’, born in 1777, and a son of Philip I Yorke and Elizabeth Cust. Brownlow died in 1803. That gave me a rough idea of the age of the book. Turning to the ESTC (English Short Title Catalogue), which lists all books printed before 1800 in England and in English, it was time to try finding other copies of the same work so that my own catalogue entry could be completed. This is where it got tricky. Although I managed to track down the most likely candidate for this mystery volume (Cornelis Schrevel’s Lexicon manuale græco-latinum & latino-græcum, a standard dictionary), it turned out to have been published in four different editions in the late 1780s and 1790s. My hunch is that it might be fifteenth edition published in 1791, which would make it an appropriate item for a 14-year-old boy learning his classics, but without being able to compare it with other copies (digitised versions are available, but only via subscription), I cannot be definitive. Tagged cataloguing, Eighteenth Century, Erddig, ESTC, Historic Libraries, National Trust. Bookmark the permalink.